While nations, groups, and individuals all over the world observe time in their own particular ways, the world comes together under the idiosyncratic structure of the Gregorian calendar. And as these final days of the month named for the first Roman emperor play out, we can each take stock of how we’ve spent or squandered the first two-thirds of the year. More important, how will we better utilize the remaining third? Think about it now, because you’re likely to forget about such serious matters by the time the weekend rolls around again! My annual Piping Plover pilgrimage to Assawoman Island on the Virginia coast struck gold as usual. However, more impressive than shorebirds for me were the seven species of tern that (hehe) turned up, especially the cackling flocks of Black Skimmers that wheeled right overhead. Corey got out to Jamaica Bay this weekend and while he didn’t find any rarities he was pleased to see a variety of juvenile shorebirds. 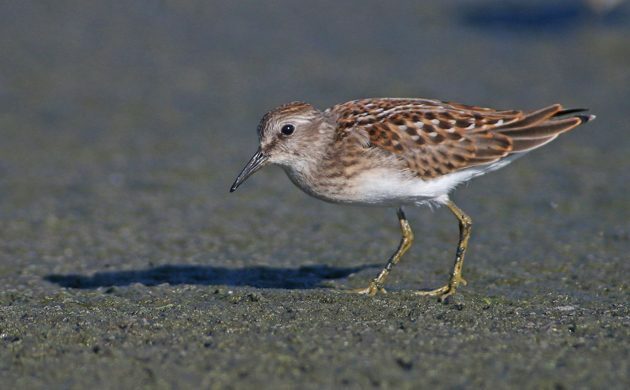 Of those he saw he was most pleased with the gorgeous plumage of young Least Sandpipers and he decided that the smallest shorebird was a perfect Best Bird of the Weekend. Cape Rockjumper! Pretty good lifer, although the Cape Siskins on the same hillside were nice too. Male Cerulean Warbler in a mixed flocks of tanagers, euphonias, and other birds near Alberque del Socorro, Costa Rica. During a trip that was dedicated to photographing a pair of Varied Buntings, they were not cooperative, I got to see on my second ever Zone-tailed Hawk. American Golden-Plover. My first one in Vermont, and second ever. With a mixed group of shorebirds that added six species to my year list. What’s not to like? !